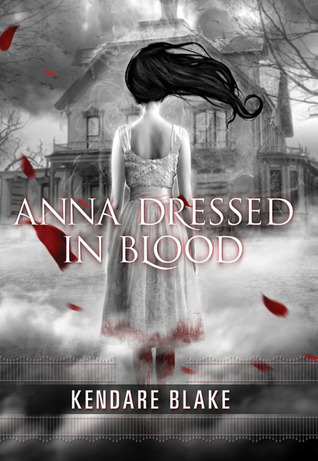 Presenting Anna #1 Anna Dressed in Blood by Kendare Blake. Ghost Stories. Now you all know I don't read this sub-genre very much except every now and then when I get a craving for it (man i'm making it sound like food aren't I *wink*)..... but yes whenever I do I find books with the ultimate factor, they should be scary enough.... And Kendare Blake's Anna Dressed in Blood fills the criteria rather well (and that's saying something since I was reading it after midnight *shivers). Theseus Cassio Lowood. A rather mouthful of a name, so i'll use Cas (just like the characters). Born and brought up in a very unconventional family. Mom's a white witch and Dad was the killer of the undead, until he was killed by the ghost or thing he was hunting..... resulting in Cas inheriting the ghost hunting business ever since he was 14 years of age, killing already dead people or rather the echo they leave behind in cases of violent or gruesome deaths. Why do these ghosts stay behind? Why can't they find rest in the after life? What prompts them to kill? What happens when Cas kills a ghost with his athame? Just where do they go? Questions Cas never asked. Questions Cas had never had to ask, not until he went to Thunder Bay and met Anna Korlov - Anna Dressed in Blood. A deadly, dangerous and very much murderous. Tied to the house she died in. Slit at the throat and covered in blood. And nobody has lived to tell the tale. Just imagine a pale echo with inky black hair floating and white party dress stained and dripping with blood. She does not take kindly to guests at all....... ripping out their innards *shivers*. And Cas was rather fantastically written too wasn't he. Strong and aloof. He understands ghost hunting is a deadly endeavor and could get you killed but meeting Anna changes not only him but us as well. Just when we thought we knew Anna. Things unravel. And you just can't help but feel the utmost pity for her..... She did not...... scratch that nobody deserves to die like Anna. Kendare Blake sure cannot a tale of the ages. This has everything a horror reads needs to flourish. Dark atmosphere. The deadly vengeful ghosts. The blood and gore and the vivid and brutal description of all things ghostly..... looking forward to begin Girl of Nightmares now. "Look no further than Anna's for the horror you are looking for"
I'll have to check this one out. I've heard so much about it! The basement scene! That scene still sticks with me, all this time later. I can't think of this book without thinking of that scene. I loved this story SO much. Cas may have been one of my first actual book crushes!